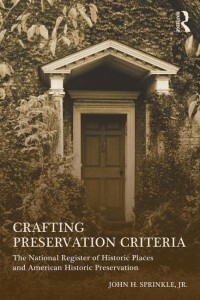 This Spring marked the publication of our own John Sprinkle’s latest book, Crafting Preservation Criteria: The National Register of Historic Places and American Historic Preservation by Routledge. 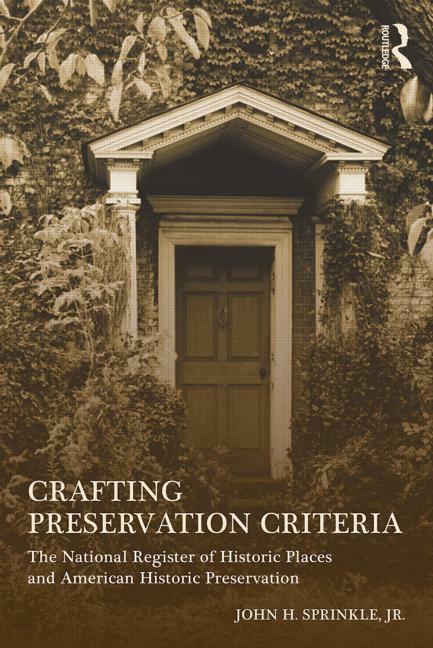 This work examines the evolution of the criteria used by the federal government to identify historic sites worthy of preserving, and serves as a pretty excellent history of historic preservation in modern America more generally. I’ve read it already myself and found it fascinating, and heartily recommend it to everyone involved in our program, whether or not they’ve been lucky enough to be enrolled in one of Dr. Sprinkle’s courses. You can order it from your favorite bookseller, and it’s even available as an e-book. Happy reading!